How many words of Nahuatl do you know – the language of the Aztecs? And how many words of this complex, agglutinative language (spoken in various modern forms by about 1.5 million people across Central America today) do you think have made it into English? As we said above, the first Europeans to encounter chocolate were the Spanish conquerors of Mexico, and it is thus through Spain that chocolate enters the European diet and other European languages. Unsurprisingly, then, one of the earliest mentions of it in our manuscript holdings comes from someone based in Spain. Lady Ann Fanshawe, whose husband was posted by Charles II as ambassador to Madrid as a reward for his loyalty during the Civil Wars, compiled a book of recipes which is now held here as MS.7113: many of the recipes are annotated to record that she learned them in Spain. 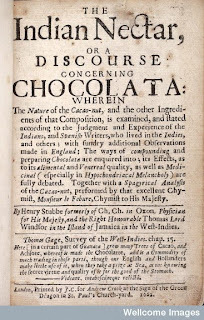 On August 10th 1665, according to the marginal note, she transcribed a recipe for chocolate. 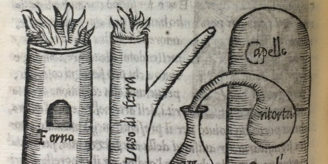 The recipe is crossed out, perhaps indicating that it was unsatisfactory, but pinned to the page is a little sketch of “the same chocolaty pottes that are mayd in the Indes”, a little round-based pot with a long handle to take in one hand whilst one whips the mixture with the whisk shown next to it. 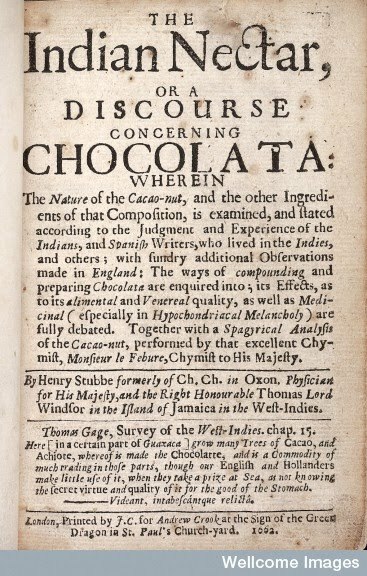 Other chocolate recipes, which the compilers seem to have found more satisfactory, occur in the recipe books of Philip Stanhope, 1st Earl of Chesterfield (1584-1656) (MS.761), compiled from the 1630s onwards, and an anonymous recipe book compiled from 1650 onwards (MS.6812). 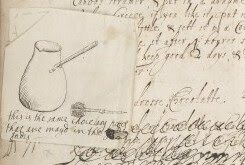 As is so often the case, our digitised seventeenth century recipe books are a fertile source of recipes. 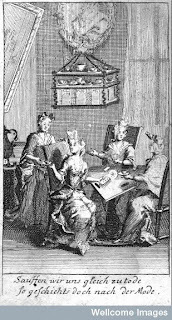 A similar caution is expressed in a work by M. Duncan published in Leipzig in 1707, Von dem Missbrauch heisser und hitziger Speisen und Geträncke, sonderlich aber des Caffes, Schockolate, und Thees (stated to be a translation of a French work). 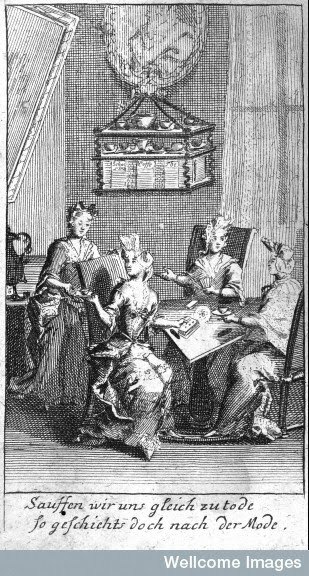 Chocolate and other hot drinks are seen as unhealthy fads, which fashion-victims indulge in only to their long-term detriment: the frontespiece shows young women gathering to drink these fashionable beverages even though, as the alarmist verse beneath claims, they are coming close to death by doing so. Who would have thought that the humble cup of cocoa could be such a walk on the wild side? We seem, as a culture, to have overcome any scruples about the dangerous American bean pretty thoroughly by now. Indeed, by the late nineteenth century chocolate is being used as a vehicle to make medicines palatable. In the archives of Henry Wellcome’s drugs company we find a large certificate of merit (WF/M/C/13) awarded by the Sanitary Institute of Great Britain for various Burroughs Wellcome products involving extract of malt. Anyone who has read Winnie the Pooh knows how unpalatable that could be, so it is no surprise that one of the mixtures involves chocolate. If Milne had made Kanga offer Roo his extract of malt in this form, it might well have gone down more easily (and Tigger might have been poisoned by the theobromine rather than finding he liked extract of malt: so, a narrow escape). 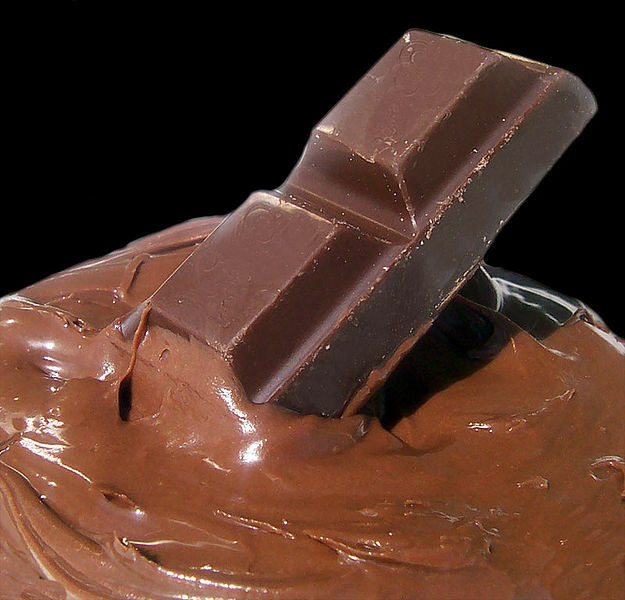 1/ Chocolate, from Wikimedia Commons. 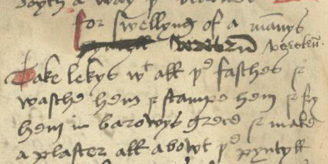 2/ Lady Ann Fanshawe’s recipe book, MS.7113: detail, MS.7113/87. 3/ The Indian Nectar… by Henry Stubbe, title page. 4/ Von dem Missbrauch heisser und hitziger Speisen und Geträncke, sonderlich aber des Caffes, Schockolate, und Thees, frontespiece.